A face familiar to employees of Lucasfilm’s Digital Arts Center at San Francisco’s Presidio can now be found at Lucas’s own alma-mater, USC. (Official Star Wars Blog). Cinematic innovator Eadweard Muybridge, whose bronze likeness [by sculptor Lawrence Noble] shares company with television inventor Philo T. Farnsworth, special effects pioneer Willis O’Brien, and even Jedi Master Yoda at Lucasfilm’s Presidio complex, has also been installed at the University of Southern California’s campus, famous among other things for its cinema department (of which George Lucas was a student). 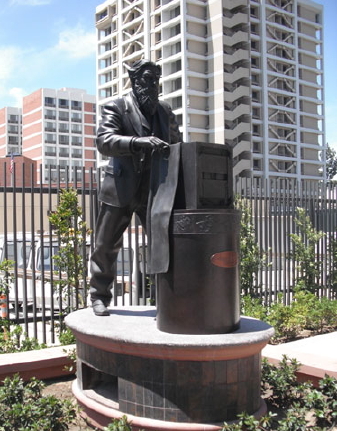 The Muybridge bronze comes as a gift from Lucas, who has long been a supporter of cinematic arts in education since his days at the university. 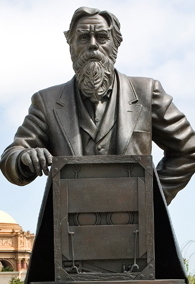 The statue of Muybridge (Father of Cinema) is one of three that Noble sculpted for the Letterman Digital Arts Center at the Presidio of San Francisco, to pay tribute to pioneers of the Motion Picture and Television Industries. The others are of Willis O’Brien (Father of Special Effects), and Philo T. Farnsworth (Inventor of Television). He also sculpted the Yoda Bronze, which sits on top of the Yoda Fountain. More on The Compleat Muybridge. This entry was posted in biography, film, news, sculpture and tagged George Lucas, Lawrence Noble, Muybridge, Muybridge-related artwork, news, Star Wars.